One of the best methods of delivering more information about the visitors to your Website is to use free phone and other trackable phone numbers that give very useful statistics about the callers. We provide an 0800 number or a local STD code number which is only used on the Website (we can provide additional numbers for adverts in magazines etc.) 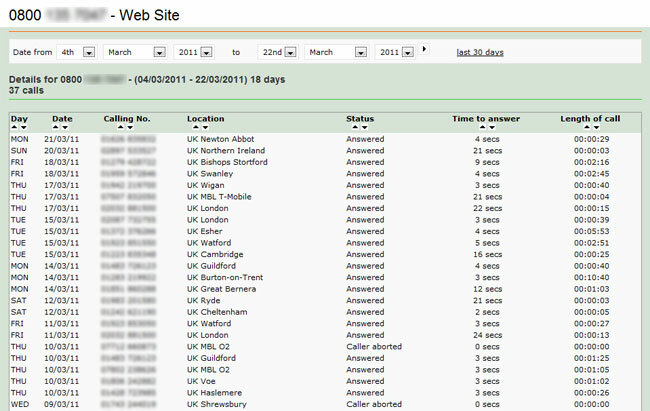 - we also provide a login to our Website which allows you to see who has called your number. This information includes the caller's number, their location, the length of call and the time taken to answer. Because the number only appears on the Website, you can be sure that everyone who calls it must have seen it on the Website. Because we believe this facility is so important we waive the usual set up fee. You only pay the call charges (rounded up to the nearest £5) which for most clients amount to £5 or £10 per month (plus VAT). Eventually this allows us to make a small profit on the service but our motivation is that you can prove where you get your business from (usually your Website). Do I need to get another phone line? - No, the new number is just routed to your existing land line (or mobile) . Is there a minimum contract period? - No, we charge monthly in arrears, after that you can choose whether you want the number or not. Do I need to be a Cravenplan client? - No, we can (and do) provide trackable numbers to companies who don't use us for anything else (yet!). Can I have a local number rather than an 0800 one? - Yes, the only difference is that we do charge a small one-time setup fee for these (£25 plus VAT). All the other features are exactly the same as for the 0800 numbers. What is the cost of the calls themselves? - This depends on where the 0800 number is forwarded to - if it rings your landline the cost is 3.5p per minute, if you have it forwarded to your mobile then the cost is 12p per minute. These charges are used to calculate your monthly bill but they are NOT in addition to that bill. So, if you get 100 calls each lasting exactly 1 minute (call charges are actually calculated by the second), then the charges to us would be £3.50. We round this up to £5 (plus VAT) which is what we charge you. Nothing else to pay! What's the catch? - There isn't one!! This is, quite simply, the best way to track what marketing is bringing you business.